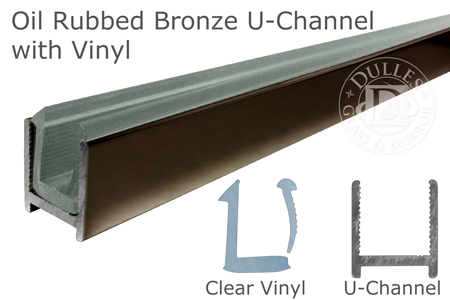 98" Oil Rubbed Bronze Dry Glaze U-Channel with Clear Vinyl is a oil rubbed bronze metal u-shaped channel and clear vinyl combo for shower door installations which replaces the need for silicone sealants between the glass and metal. This means a quicker and neater shower door installation. For use with 3/8" (10 mm) glass shower doors. The clear vinyl hugs the inside of the u-channel where the glass rests and secures the glass. U-channel and vinyl will give your shower enclosure a clean, sleek look. Comes in an ample length of 98 Inches. Keeps the water inside your shower. Comes in Oil Rubbed Bronze (U-Channel also available in three other color options.) Vinyl is clear colored. Mfg. by Troy Systems in the USA. Shipped by UPS. Perfect for do-it-yourselfers.